In 2014, getting outside is more popular than ever; and the rallying cry for the new exploration of the wilderness is “go to the mountains and seek their tidings”. Unfortunately, on many occasions, especially during the summer months, it is hard to find the tidings of the mountains when you are surrounded by your fellow man. Fortunately, the tidings of the wilderness, the mountains, and in this case, the ocean can still be found – but they can be only found a little bit off the beaten path. A perfect example of this is Humbug State Park. This park is a gem of wilderness that is located on the beaten path – in this case, Highway 101, but is also off the beaten path as well, as it is located in a remote part of the state, six miles south of Port Orford on the Southern Oregon coast. The park takes its name from its signature attraction, Humbug Mountain, which rises 1,756 feet above the ocean. While Humbug Mountain will never be confused with Mount Everest, or Oregon’s signature peak, Mount Hood, it is a massive headland that dominates the coastline for miles around. In addition to being an imposing mountain, it contains a sprawling old-growth temperate rainforest. There are a number of trails that head up the mountain, but the most popular trail is the Humbug Mountain trail that leaves directly from Highway 101, and winds 1.5 miles to the summit of Humbug Mountain. When I hiked the trail, I encountered nothing but the silence of the forest, and the chirps and rustles of birds and squirrels during my three mile roundtrip hike to the summit and back. As I walked under the trees, and through the early morning fog, I felt like I had gone back in time, and was indeed hearing the eternal tidings of the mountain. If the solitude provided by the mountain wasn’t impressive enough, Humbug Mountain State Park also boasts a spot that provides sublime serenity: its beach. Generally, the Southern Oregon coast is a stunning area, with jagged cliffs, lost ocean bound rocks, rumbling waves, and expansive, empty beaches. The most accessible example of all of these features is the beach at Humbug State Park. Although the beach can be seen directly from Highway 101 heading south, it appears inaccessible due to the bridge, and the cliffs surrounding it. However, the beach is actually quite accessible from the interior of the park. After my hike up Humbug Mountain, I walked through the campground, and onto the beach trail, which parallels Brush Creek as it runs down to the ocean. 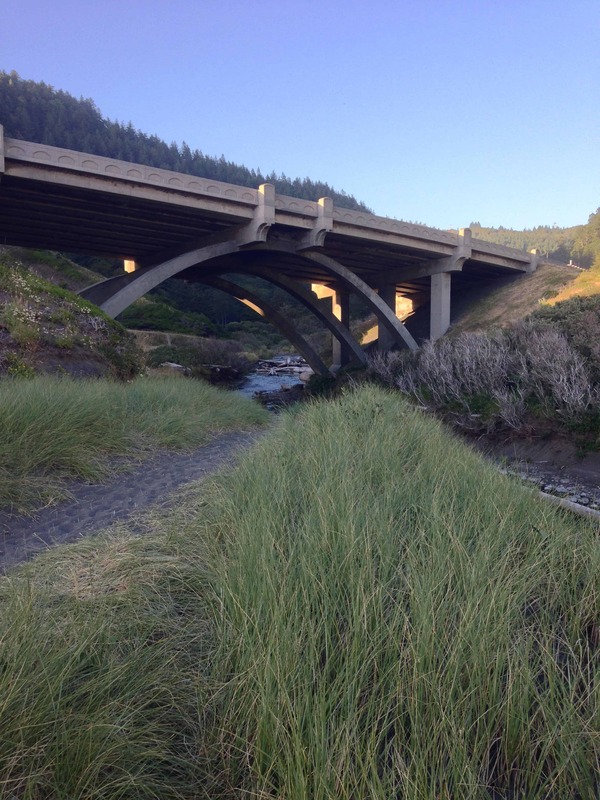 The trail heads under the Highway 101 bridge, and then ends next to Brush Creek as it empties into the ocean. At that point, if you are visiting, you will see what I saw: an endless expanse of sand, bounded only by the towering monolith of Humbug Mountain to the South and various rocks to the North. As I walked along the beach, I saw nothing but driftwood, rocks, and shorebirds. There were no people. The beach was so tranquil that after walking around, I sat and watched the sun set into the late evening fog, and listened to the timeless sound waves breaking against the shore. Had the sun not set, I would have lost all track of time as I sat on that beach. I was so impressed by the beach that I woke early the next morning to visit it again before I left the park, and found it covered with hundreds of strange blue creatures. As there was no one around, and no explanation of what they were, I had to utilize Google to learn what they were. It turned out they were Velellas – commonly known as by-the-wind-sailors, jellyfish like creatures that had been blown ashore by the wind – and something that I had never seen before through all of my many travels along the many shores of the world. This, among everything else made me realize that even today, the voice of the mountains still speaks – and still speaks loudly in remote places, such as Humbug State Park.